I am new to this challenge called Curtain Call Inspiration Challenge. I wanted to try it out and make my first submission with this card. Lawn Fawn is the sponsor and I of course wanted to incorporate some Lawn Fawn in my card. All of the pattern papers, EVEN the photo come from THIS 8 x 8 pad from October Afternoon. I took half sheet of the ticket page and cut then down into strips and adhered them on an angle in different directions. Then, I was looking through the paper pad and I came across the young couple photo and thought it would be fun to cut it down and put it behind the Polaroid from Lawn Fawn's Say Cheese. I wanted to make the frame look like it had aged, so I added some Old Paper Distress Ink, and then took THIS calender stamp from Amy Tangerine, and stamped my month ( at random ) and the same for the year using the numbers from THIS Lawn Fawn set and stamped beside the month ( again, I picked a random year). 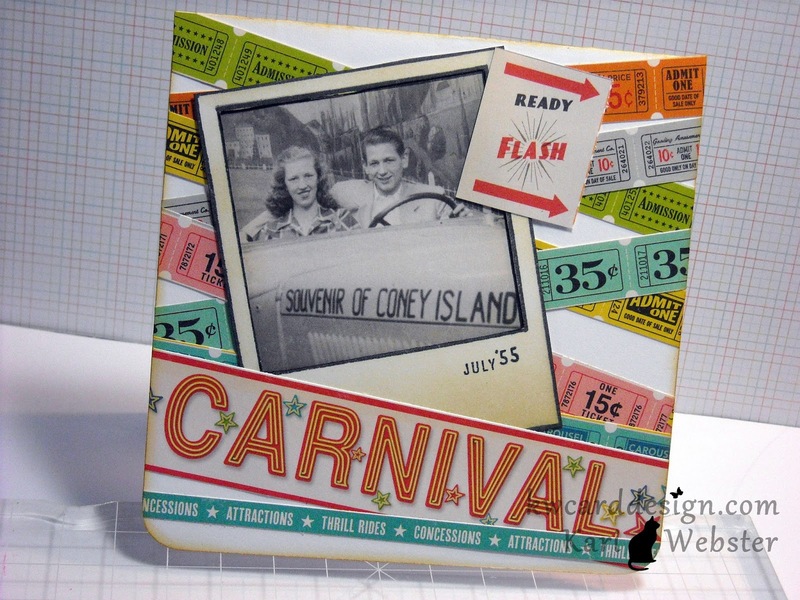 I adhered my photo onto the card, and then found the "Carnival" strip and the bottom teal strip and also cut those down to size. I found the little photo "Ready, Flash" element and added it to the corner of the photo. This was a different kind of card for me, but I had fun playing with it to get it to the final result. WOW! 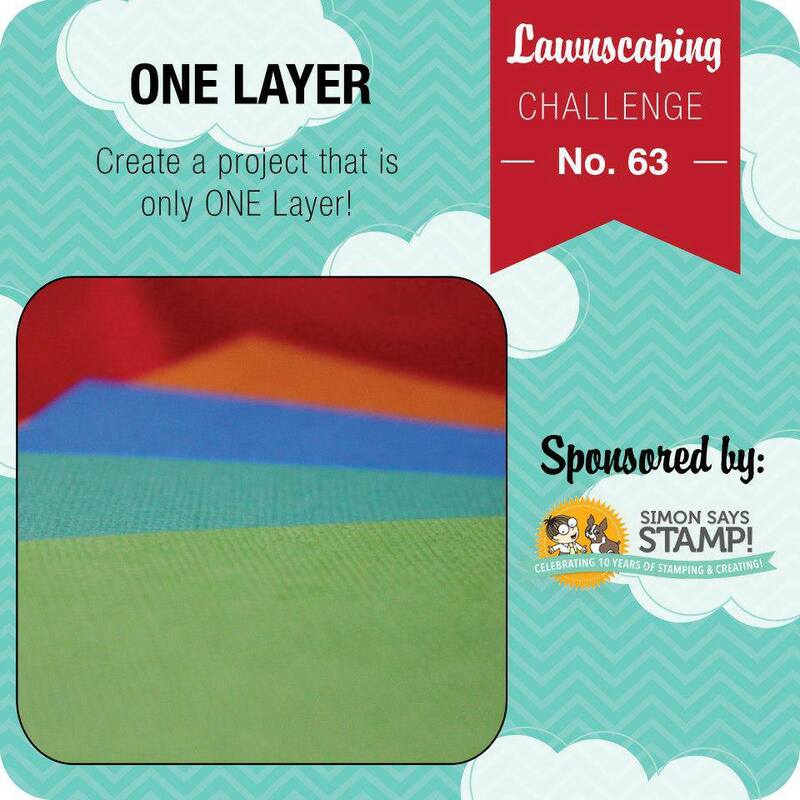 Back again to introduce a new Lawnscaping Challenge!! We getting Distressed!! This challenge is all about making your projects look Distressed with inks, sanding, etc. Up for grabs is a gift certificate to the oh so wonderful Lawn Fawn!! And, with there new releases about to be available very soon - now it is a great time to enter! I used some Core'dinations paper that I had in my stash and I dry embossed my paper with a diagonal stripes embossing folder, and then sanded my paper to bring out the color core!! I, then added some washi tape with the same color scheme that I was going for. Then, I stamped out the polaroid from "Say Cheese" ( my very first Lawn Fawn stamp set - I treasure it!) onto some more Core'dinations paper but on the color core side to make it look "aged". Then, I took one of the element stickers from the Dewey Decimal collection, and added it to the middle of my frame using foam adhesive. I felt like my card needed one more thing, so I found a peach colored button in my stash and added some Lawn Trimmings to the button and adhered it to my frame. This whole card panel was adhered to a piece of Hawaiian Shores card stock, and then onto a Kraft card base. Hope this inspires you to enter into this week's challenge!! I am looking forward to all the entries!! Be sure to watch throughout the week for additional inspiration from the Facebook Inspiration Team! Good Sunday to you all! Hope everyone's weekend has been a good one! Today, I wanted to get a little crafty time in, and pulled out some supplies that I don't use often, but still love! I have THIS Sizzix and Hero Arts Stamp and Die set that I think is the prettiest out of all of these sets ( IMO) - and wanted to break it out as I don't use it often enough. I also don't use my Copics all that often. I am not a big person on coloring, but I do like to do it every now and then. 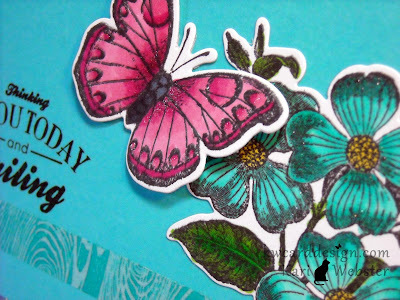 I stamped the biggest butterfly and flower images of the set with Memento Tuxedo Black ink, and colored the images using RV34, RV19, BG13, BG15, YG63, and G05. Then, I used the coordinating Sizzix dies and die cut the images ( which is the most fun part for me!). I, then cut down a piece of Hawaiian Shores from PTI, and scored and folded to a standard A2 size card. 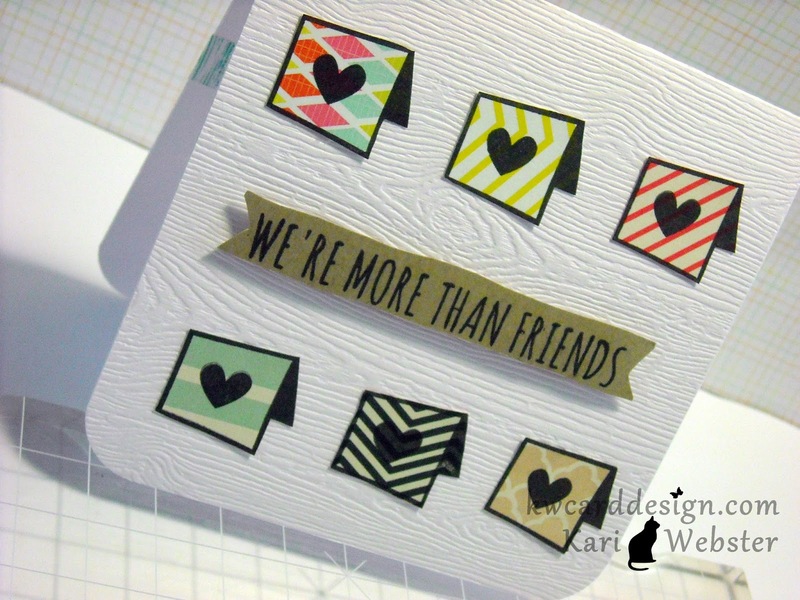 I, then pulled out some wood grain patterned washi I had that is about the same color and added to my card base to give a bit of interest and pattern to my card. My sentiment also comes from the PTI set We Go Together. To finish off the card - I just added some glitter using my Wink Of Stella pen. Hi everyone!! I just want to invite you to head over to the Lawnscaping Blog today to check out a tutorial I put together for a holder for the small hand sanitizers you can buy at Bath and Body Works!! 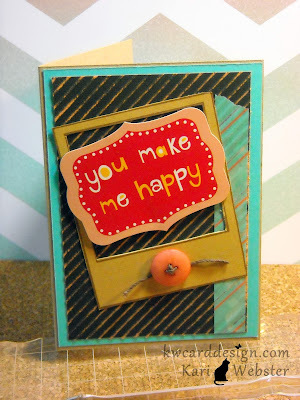 Head on over and get the details of how this cute little holder is made!! 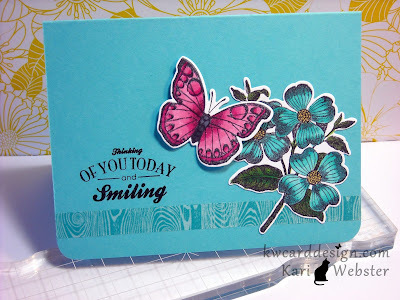 Hi all - I just wanted to share with you my video tutorial on the card below! 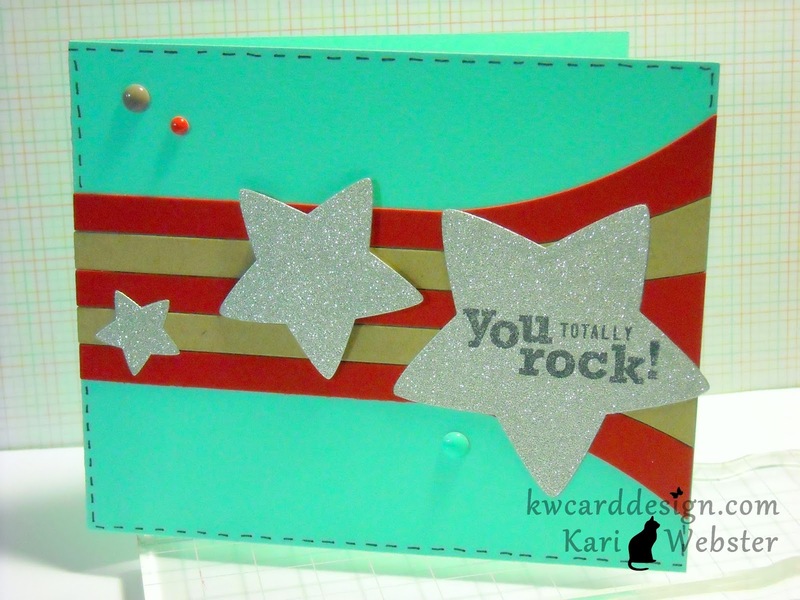 It has been FOREVER since I made a card tutorial! I remembered why today - It took me all day to do the tutorial and get the video edited the way I wanted! Well - maybe since I know ( or I think I know) what I'm doing now - I will try to do more tutorials in the near future! So here it is!! Enjoy!! Happy Sunday to you all! Back to share with you another card project. Whew! Two cards shares back to back!! That's unheard of for me - especially lately! I actually created this card last weekend, but I am just now able to blog about it and share with you. This card features a new die I recently purchased from Papertrey Ink called Rainbow Stripes Die. This die is so much fun and you could do so much with it! The possibilities are endless! 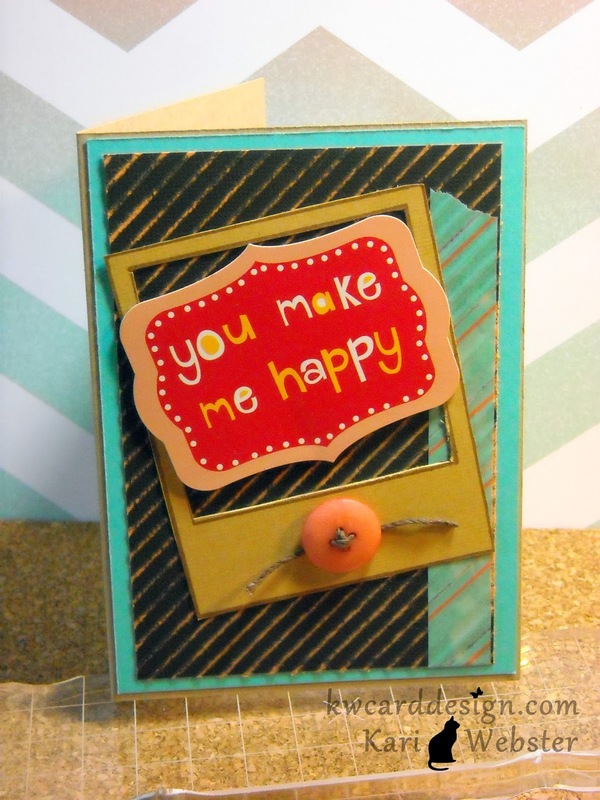 I die cut with the die twice using Kraft card stock and Wax Lips (red) card stock from Bazzill Card Shoppe card stock. I also die cut using the Lawn Fawn Puffy Star Stackables from some silver POW glitter paper by American Crafts. To me, this is the best way to have the glitter look and there is no fuss or mess - the glitter will not come off! Love it! I stamped my sentiment "You Totally Rock" that come from the stamp set "For The Record" from Simon Says Stamp. It seems pretty much all my cards have this teal color incorporated somewhere! I am obsessed with this color!! To finish off my card - I added a few enamel dots and some faux stitching. Hope your weekend has been great! Thanks for taking time out to visit today! It feels so great to be in the craft room this evening!! I don't know what it is, but I don't get to sit down and create as much as I'd like to! I am finally getting to play with my SSS August Card Kit ( which is sold out - sorry to those that might have been interested) Good news is though - there are some of the products in the kit that are sold individually and are available for purchase! This kit is such a great one too! Well, all of the SSS kits usually are - and this one is no exception!! Most of the items you see on this card were used from the kit, however the die cut leaves are from a die and stamps from PTI, the "Just Because" comes from "Handwritten Sentiments" from SSS, and the green card stock was just a piece that was from my scraps. I love these colors together! So happy! YAY! 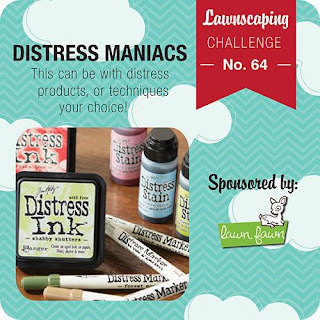 It's time for a new Lawnscaping Challenge. 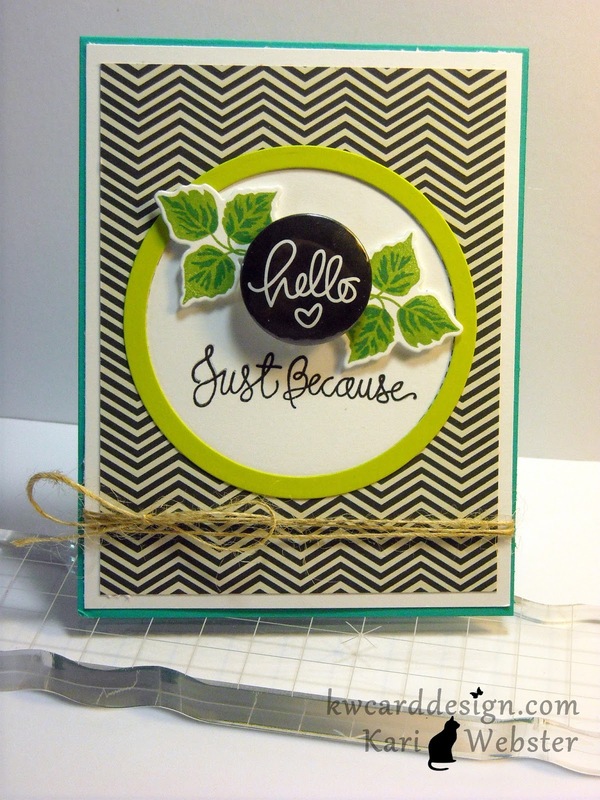 It's all about creating a one layer card this go round!! What?? One layer? It seems doing one layer cards can be a challenge - which is true - but I feel if you think about how you would create dimension one others ways like masking - or doing even CAS cards - you've achieved the goal of mastering a one layer card!! Here is my card for this week's challenge! I actually enjoy the thinking process of what I will create when making a one layer card. For this card - I started out by masking off a section of my card base with some masking paper on a diagonal and then I grabbed some of my favorite Distress Inks - Peacock Feathers, Picked Raspberry, and Chipped Sapphire and blended them little by little all over my card base. When I finished I just sprayed some water in my hand from my mini mister and flicked the water onto the card to create the water droplet effect since these inks are awesome when reacting with water. I then took the "glow" circle image from Summertime Charm and stamped it randomly all over the card base - I even did stamped off once after inking my stamp and interlocked some of the circles. I carefully removed my mask ( this is when the magic happens!!) and then I stamped my sentiment Grand Greetings. I like the overall look to my card!! Hope you do as well!! Be sure to head over to the blog and feast your eyes on all of the awesome creativity from the DT, and keep your eyes open to FB as my teamies and I bring you additional inspiration through out the two weeks of the challenge!! Wow, the weekends go by super fast!! Just when I am getting into a relaxed frame of mind - its back at it again for the work week!! Oh well, that's life isn't it? 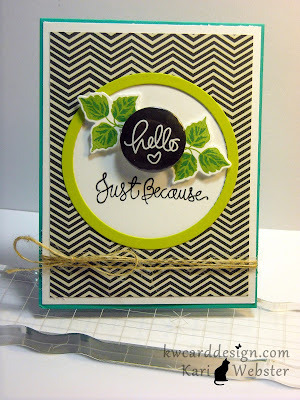 Stopping in to share with you a quick card - for this CAS card, I used one of my favorite stamps from Neat and Tangled. This one is the Ink Splash. 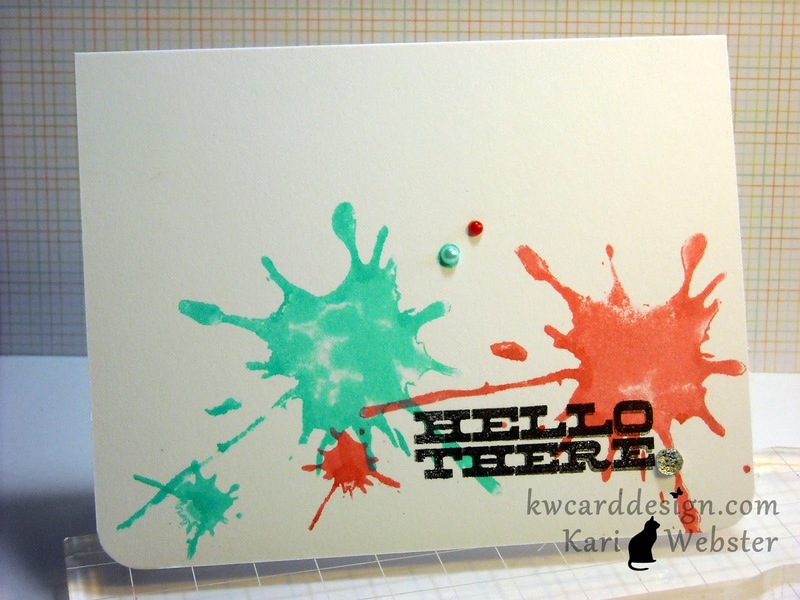 I stamped it in my two favorite ink colors - both by Hero Arts - Pale Tomato and Tide Pool. 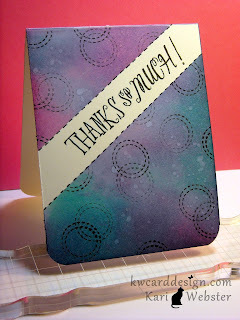 Then, I stamped my sentiment that comes from the Hey Day Sentiments also from Hero Arts. Then, to finish off this card I added a few pearls and gems. Hope your weekend was a great one!! See ya back here soon!